Bone broth is one of those foods that has faded in popularity, but which is coming back thanks to its numerous health benefits, copious nutrients, and great versatility. Unfortunately, you can’t rely on store-bought broths and stocks. These most often contain artificial flavors, MSG, too much salt, and even when organic, lack the most important nutrients that you get from homemade stock. With a little practice you can learn to make a nutritious and delicious broth that can easily become an important and life-changing part of your daily diet. Bone broth, stock, broth, by any of these names, this one-time kitchen staple has largely disappeared from the modern home. A big stockpot used to be a regular fixture in kitchens where thrifty and frugal homemakers would use the spare parts of fish, chicken, turkey, and other types of meat to create a stock. The stockpot was also a receptacle for the throw-away parts of vegetables, like carrot tops and potato peels. Some clever homemakers would even ask the local butcher for spare bones and other leftovers to add to the kitchen stockpot. By making a broth, they could save money by getting nutrition out of every part of an animal. A bone broth is any broth or stock that includes the bones of an animal. These can come from fish, poultry, beef, pork, or game. 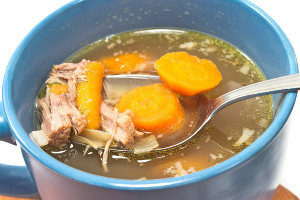 Traditionally, the making of bone broth was a way to use up the leftover parts of an animal, not just the bones, and to extract every bit of nutrition from an animal. In cultures all over the world people use the bones, hooves and feet, knuckles, cartilage, and tough bits of meat that no one wants to eat to make broth. From Korean seolleongtang to Mexican sopa de lima and Jewish chicken matzo ball soup, people the world over have been making and benefiting from bone broth for millennia. While the tradition of making broth probably began as a way to make as much use of an animal as possible, it wasn’t long before people discovered the healing and nourishing power of this superfood. Everyone is familiar with the idea of using chicken soup to heal someone with a cold, the flu or nearly any other illness. That old tradition is based in the simple fact that good, homemade stock or broth is chock full of important and healing nutrients. You can’t use canned chicken soup to heal anyone, but homemade soup can work wonders. What makes bone broth so special is the concentration of nutrients, like minerals, collagen, and amino acids that work wonders for your health. Fighting infections. The tradition of feeding someone chicken soup for a cold is an old one and it really works. Of course, condensed and canned soup won’t do, but homemade chicken broth has been proven in scientific studies to reduce the symptoms of upper respiratory infections by bolstering the immune system and reducing inflammation. Recovery after exercise. Bone broth has also been shown to help athletes recover after a workout. It both rehydrates and resupplies the body with electrolytes lost through sweating. The amino acids, building blocks of proteins, found in bone broth are also helpful for rebuilding muscle after exercise, especially strength training. Healthy digestion. Bone broth promotes digestion, thanks to gelatin. The same gelatin that goes into Jell-O products comes from the collagen and other proteins in bones, tendons, hooves, and ligaments of animals. You get a healthy dose of gelatin in every serving of bone broth. Gelatin promotes digestion by sealing and healing the gut. It lines the inside of the gastrointestinal tract (GI), preventing nutrients from leaking out while also reducing inflammation. This makes bone broth especially helpful for anyone with leaky gut syndrome. Liver health and function. Gelatin is essentially a mixture of proteins and proteins are built out of amino acids. One of those amino acids, glycine, is abundant in gelatin and is essential for liver health. The liver is the body’s detoxing organ, but its ability to detoxify is limited to how much glycine it can access. To keep your liver in tip-top detoxifying shape, glycine from daily bone broth is a good start. Bone health. Not surprisingly, a broth made using bones is good for your bones. In studies with mice, those given gelatin as part of their daily protein had significantly higher mineral content in their bones and higher bone density. Other studies have pointed to the fact that collagen, which is found in bone broth, can help strengthen the bones of people with osteoporosis. Joint health. You can take glucosamine and chondroitin supplements for your joints or you can get these important nutrients directly from the source in the matrix of nutrients nature intended. Bone broth is rich in these nutrients that are necessary for properly functioning joints. They help reduce inflammation and reduce pain. Hair and nail growth. Gelatin supports the growth of hair and nails, both of which are made of protein. If you have weak or brittle nails or hair, you will notice them strengthen after a couple of weeks of supplementing your diet with bone broth. With greater strength they will both be able to grow longer. Beautiful skin. The same collagen and gelatin that promotes hair and nail health may also make your skin look more youthful. Collagen is very elastic and gives our skin that bounce-back effect. As we get older we produce less collagen and our skin starts to sag. Collagen-rich bone broth may help fight that loss of elasticity and result in smoother, less wrinkly, and more youthful-looking skin. Fight inflammation. Bone broth has a lot of protein, but it is particularly stocked with the amino acids proline, arginine, and glycine. All of these are important in reducing inflammation in the body. This may be the reason that broth helps to fight infections, like colds and the flu. Sleep better. The amino acid glycine has a calming effect on the mind and body, so a daily dose of bone broth promotes good quality sleep. Glycine is also important for improving brain-functioning and memory. Vitamins and minerals. Bone broth is chock full of vitamins and minerals. Particularly important are the fat-soluble vitamins, like vitamin D. These vitamins are best absorbed when eaten with fat, which means that bone broth is an excellent source. Bone broth also contains minerals that are well-absorbed in this form including calcium, magnesium, silicon, and phosphorous. Many of the healthful benefits of bone broth come from the naturally occurring gelatin. You can supplement your diet with pure gelatin, so is it necessary or better to use bone broth instead? The answer is yes. You will get some nutritional benefits from just using gelatin, but you get much more out of bone broth. One reason is that for your body to utilize the amino acids in gelatin that are so healthful you also need fat-soluble vitamins A and D. These are found in animal products, so including the meat and fat from the bones in your broth makes it a more complete nutritional supplement. Gelatin by itself can’t provide these vitamins. Another reason to use broth in favor of gelatin is for all the other nutrients, especially the minerals, that are found in bones, cartilage, and other tissues used to make it. Aside from the miraculous nutrition in bone broth, the great thing about it is how easy it is to make. You can make one big pot of broth and use it for days. All you really need are bones and fresh, cold water, but you can add other elements too. Include organic vegetables or herbs for extra flavor and nutrition. You can also add salt to taste, but avoid refined salt. Use Himalayan pink salt, Celtic sea salt, or Redmond salt. You can also combine different kinds of animal bones and extras to create unique flavors. Add your bones and any other extra animal parts you have for the broth to a large pot of cold water. It’s important that the water starts cold because slow heating is the best way to bring out the most flavor from the bones. Add a splash of vinegar to the pot as well. I use Bragg’s apple cider vinegar. This will help release more calcium and will break down any pieces of meat left on the bones. Heat the pot slowly until the water starts to boil, then turn it down to a low simmer. As the broth cooks you will see a sort of “scum” rise to the surface. For the best tasting broth, skim this off occasionally and dispose of it. It is made of large proteins, alkaloids, and impurities that can make your broth taste funny. If you’re making fish broth, you will have a finished product with just a couple of hours of simmering. For poultry, let is simmer all day and for beef broth you may need to let it simmer overnight. When your broth is ready, strain it with a sieve or colander. You can refrigerate the broth for several days or freeze it to keep it for months. You can also boil your broth down to create a jelly-like substance, which can be rehydrated later with fresh water. This is a good way to keep broth if your freezer space is limited. For how to videos on making the various kinds of bone broth check out The Healthy Home Economist’s videos on making stocks and broths. Bone broth is a warming, comforting, and delicious food and you won’t find it hard to make it a part of your diet. A good way to get it every day is to start each day with a cup of hot broth. I usually have a small glass of water with lemon first thing, a cup of broth half an hour later, followed by my morning smoothie shortly after. Try adding a little miso and/or cream to bolster your broth – my favorite additions to a cup of broth. Of course you can use broth in a traditional way by using it for soup. Homemade soup is a great way to get bone broth in your diet, but also to include a lot of other nutritious foods like vegetables, meats, eggs, and whole grains in a convenient format. Authors Sally Fallon and Kaayla Daniel provide a wealth of information on why and how broth heals and supports your health. Not only did my eczema clear up, my ability to concentrate and focus at work improved and my joints (knees in particular) felt that much better. Years of basketball and other sports have taken their toll on my knees. My physical strength and ability to recover after workouts also improved. Of all the superfoods I consume and have written about on this site, bone broth is atop the list. It’s exciting to see this ancient superfood get recognition once again. Take the time to make your own broth and stock your freezer with it. One full stock pot should last you a few weeks, so the effort is more than worth it for all the benefits you will get from this delicious and nutritious food. Hopefully this article inspired you to consume more of this nutrient dense superfood. How often do you make bone broth? What’s your preferred kind? Please leave your answers and thoughts in the comments below. Thank you so much for this insightful article…I find that no matter how many superfoods I consume I’m still having aches and pains that seem to linger or take longer to recover from. I am mostly vegetarian, vegan and lastly a flexitarian. I will most definitely add this to my morning routine and any other time for something simple, comforting, and nourishing when a whole meal seems too much work. I love your recipes and advice and although the broth sounds amazing, I’m a vegetarian. Any suggestions for me in this department? I know that’s a stupid question but you’re the only person I would ask. Thank you! Fantastic, Craig! It really is a miracle food. how long til i should results after starting 1 cup of bone broth every morning? Good question, Diane. It depends – on what results you’re looking for, your current health, and other health practices.